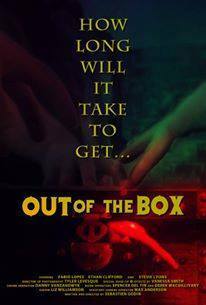 ”Out of the Box” is a short student film from Canadian monster enthusiast and future horror bright spark Sebastien Godin, but if I didn’t know otherwise, I’d just have assumed it was a regular short film from an independent horror filmmaker. The story revolves around 2 students who volunteer to take part in a psychological experiment for a food coupon. All they are a required to do is sit in a room until one of them caves and opens a box, which sits in the middle of the floor minding its own business. With starvation starting to kick in, one of them finally gives up and finds out the hard way that hunger is the least of his problems. In 1996, psychology professor Roy Baumeister conducted an evil experiment where he used students desire to eat to deplete their willpower. In this case, the allure of chocolate was enough to make them lose control; the cruel part was they were given radish instead. ”Out of the Box” contains another experiment where the willpower of hungry students is tested; only instead of chocolate the seduction lies in the mystery of a box, and the repercussion for giving into your appetite is truly sinister – even more sinister than radish. What I liked most about ”Out of the Box” was the 2 lead characters: Brian and Vince, played by Ethan Dalton Clifford and Fabio Lopez, respectively. Both characters are hilarious in their own unique way: Vince is the more outgoing and desperate – and he’s not very smart. Brian is more reserved and dry, providing a perfect counterbalance to Vince’s hyperactivity. The script is witty, providing them both with some great dialogue to work with. Furthermore, their interactions are constantly entertaining: whether it’s discussing the gender of author Jules Verne or grappling over Granola Bars, there is never a dull moment between them. Spending 12 boring hours in a room starving as part of corrupt experiment is something we all have to go through at some point in our academic lives. Their experience isn’t like anybody else’s. I said earlier that Godin was a ”future horror bright spark”, and I genuinely do believe that. Having known him for some time now, I’m aware of how creative he is. Not only are his ideas fun as shown here, but he appears to be an accomplished filmmaker. ”Out of the Box” is short, but it’s well shot, easy on the eyes and boasts some fantastic lighting, special effects and gross out make-up. I have no doubt in my mind that he’ll make movies one day that a lot of horror fans will love.